Before selecting to use an open auto transport carrier, you should be made well-aware of the advantages and disadvantages associated with this method of transport. 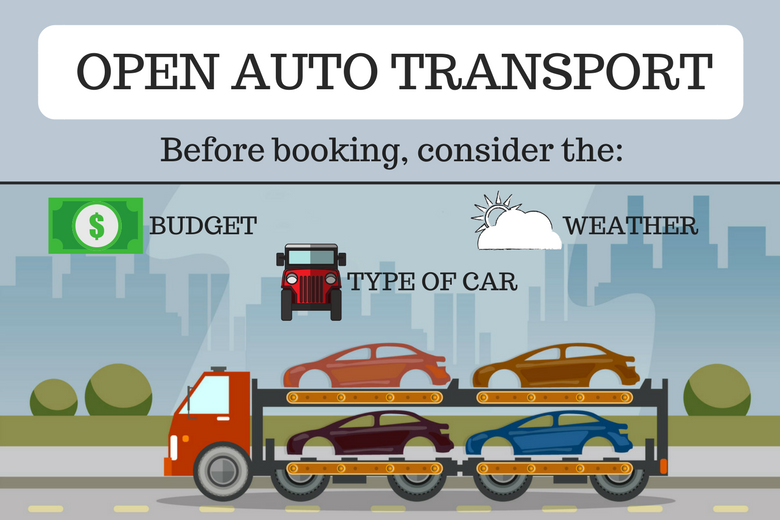 First, however, you must understand what open auto transport is. Open auto transport is the most popular method of transport used by customers to haul their vehicles from one location to another. An open-air carrier is used to transport the cars. Therefore, the carrier does not contain enclosed side walls or a roof. The two most popular sizes for these transport trucks are six and nine car carriers. At these sizes, they will often times contain two levels. Your car may be positioned on either level, unless you specify for top-loading. Side note: Some individuals choose to have their vehicle top-loaded to reduce the risk of damage from road elements. In addition, it prevents any vehicle from leaking on it from above. However, all owners are recommended to conduct proper maintenance prior to transporting to prevent any such leaks. Open Auto Transport has its advantages and disadvantages. Let’s take a look at the items to take into consideration before using this shipping method. More affordable. There are two shipping options to choose from, which are open and enclosed auto transport. In comparison to enclosed, open auto transport is less expensive. With enclosed auto shipping, the vehicle is more protected a variety of weather of elements. For this reason, it is a better option for high-priced vehicles. This is also what makes enclosed auto transport more expensive. Faster option. As we mentioned before, open auto shipping is the most common method of transporting a car. Due to this fact, these types of carriers are in higher demand. In some cases, this causes open carriers to be a faster method, because there are more widely available. Not shielded. It is important to remember that the car will be placed on an open-air carrier. This means that the car will not be protected from variety of weather conditions, such as rain, hail, and snow. The vehicle will also be exposed to a number of road and other outside elements, including dust, dirt, grime, rocks, and insects. This is one of the primary reasons why owners of classic, exotic, and luxury models choose to use enclosed auto transport over open auto transport. Whichever shipping option you choose, you should rest easy knowing that your car will reach its destination safely. Although open auto transport is a more affordable option, it still provides a safe manner of transporting your vehicle to its intended destination. Learn more enclosed auto transport. At National Dispatch, we offer auto shipping services to anywhere in the United States. We have highly-experienced drivers and knowledgeable staff. We understand how much your car means to you and treat your car with the utmost care. Check out our other services. To request a free, instant car shipping quote, use our online quote calculator or call us today at 800-321-2051.